The joy of being Catholic…again. 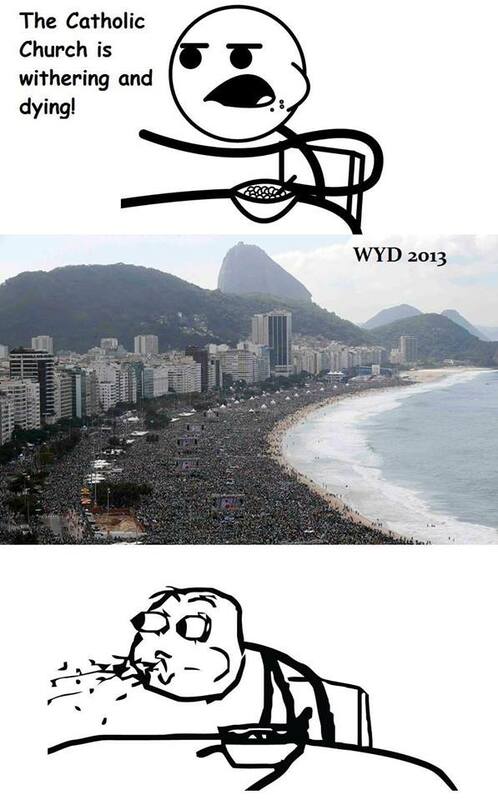 Watching World Youth Day was inspiring and exciting. To see over 3 million people in humble adoration to Christ in the Blessed Sacrament really recharged my battery. Knowing that they were mostly youth from all over the world is even more encouraging. It was such a striking image to see all the flags from various countries scattered throughout the crowd. It was an awesome demonstration of the universality of the Church. It was a hopeful scene. Pope Francis’ spoke so eloquently to the youth in his homily. I myself needed to hear his words. “Go, do not be afraid, and serve!” We need to be bold and fearless. Not offensive and abrasive, but firmly gentle about what we believe, why we believe it, and what difference it makes to us and the world. We can talk all we want, however. Without the actual service, our words lose their meaning. Just find a way to serve Christ and do it without fear. Profound simplicity. This entry was posted in Catholicism, Christian Living, Christianity, Church, Evangelism, Evangelization, Fear, World Youth Day and tagged Catholic, Catholicism, Christian Living, Christianity, Church, Evangelism, World Youth Day on July 29, 2013 by Thomas.